The director of a mental health institution believes diagnosis of "videogame addiction" is all about making money. Cheryl K. Olson, co-director of the Center for Mental Health and Media at Massachusetts General Hospital's Department of Psychiatry, has some pretty strong words for those who bill videogame addiction as its own disease. In addition to working with psychologists who have treated kids for such perceived addiction, Olson has run extensive studies on the effects of videogames on children. "I'm a little bit of a skeptic about game addiction because we did keep track of hours kids played, and more than 40 percent of the kids were saying they usually played video games only on weekends," said Olson. She mentioned that much of the motivation for calling it a separate disease is to get insurance companies to reimburse them for treatment they've sought out for videogame addiction. "It's just economics, so I can understand that," said Olson. "But what seems to be going on is that kids who have other problems will sometimes channel those through video games. A depressed kid, for example, will play video games to improve their mood. 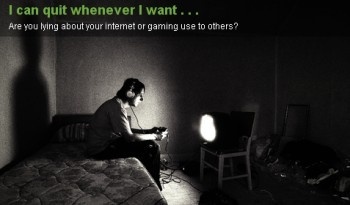 And kids with addictive personalities will play a lot of video games. Like anything that can go to an extreme, video games might become an additional problem, but usually the games, by themselves, are not the problem, it's usually tied in with other things." It is nice to hear a professional echo a lot of my thoughts on how the public reacts to videogame issues. Just because a teen plays videogames and then decides to shoot up his school doesn't mean there is a correlation. Similarly, addictive personalities, depressed kids, or people with Asperger's and ADHD may gravitate towards videogames, but that doesn't mean that videogames create such syndromes in all people. As my Dad says, everything in moderation. Of course, he also said once that he'd break my neck and throw it in my face, but I totally deserved it. I think he told me to say that.